By Mark Sauer Uncategorized Comments Off on FullContact Social Integration Is Here! FullContact is a great way to pull social media data, icons, links into your portal so you can gain useful insights into you customers, their demographics, interests, and trends. This article will show you what the integration looks like, how to create a free FullContact account, and how to setup your API key in your portal. 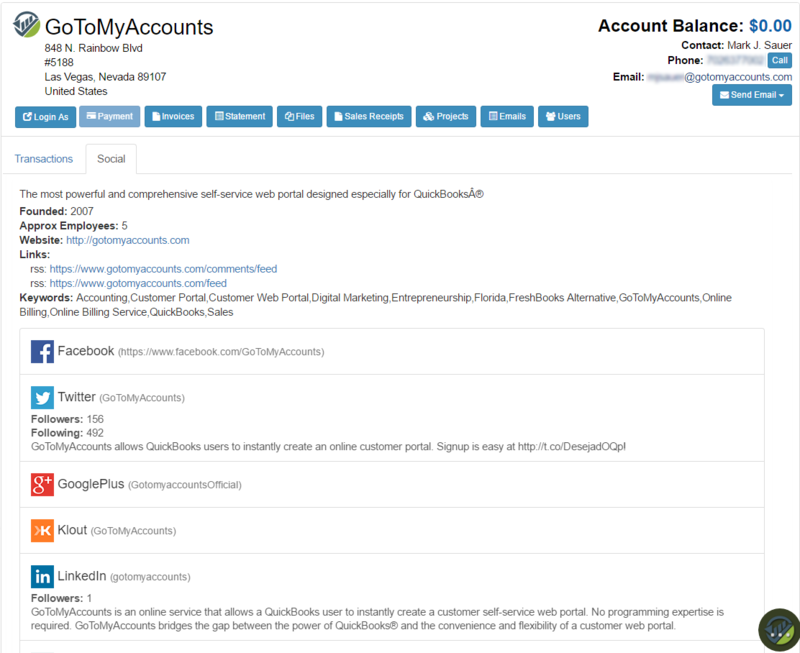 Once you have set your FullContact API key, you will see data populating inside a new customer tab called “Social”. With the current integration, we pull in organization data as well as Social Media data/links. We will display whatever data is available from the FullContact API. The way that we query data on a company is we fetch the domain from the primary user on the account and then do a lookup based on that domain. Similarly, we are able to perform person lookups based on a user’s email address. We will begin using that part of the API to display data about customer users and contacts. The first thing to get started is to create an Data Solutions account at the following link: https://portal.fullcontact.com/signup. At the time of this writing, the FREE account will give you 250 company and 250 person matches per month. Due to licensing restrictions, we can store/cache the lookup data for 7 days. After that, we will pull the data again, but not until you click on the Social tab for that customer in the portal. We will only pull data when you request it. Hence, a free account will probably work just fine for many users who have a customer list of 100 or less. If you need the ability to perform more than 250 lookups each month, you can opt for a FullContact paid plan. Their pricing is available here: https://www.fullcontact.com/developer/pricing/. Setting the FullContact API key in your portal is easy. Just click on the Settings menu, and then click on the item “FullContact Settings”. Set the API Key field and click “save”. That’s it. The “Social” tab will now be activated in your portal.